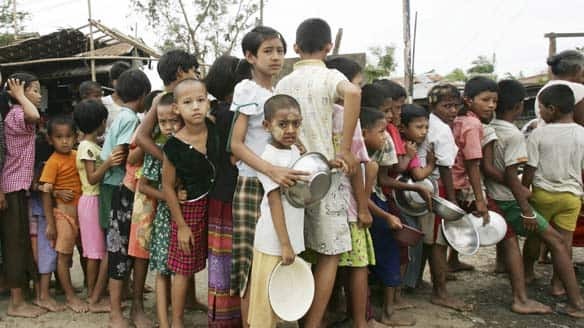 … demonstrations led by Buddhist monks in 2007, but it refuses to join its Western allies in imposing sanctions on Myanmar, formerly known as Burma. … 13 of the last 19 years, including the past six, in detention without trial for her non-violent promotion of democracy in Burma, also known as Myanmar. Aung San Suu Kyi’s lawyer says Burmese military authorities allowed the detained opposition leader to meet with her lawyers for two hours Saturday in Rangoon’s notorious Insein prison, apparently to prepare for final arguments in her trial. Attorney Kyi Win told VOA Burmese Service that the Nobel peace laureate is in good health. A spokesman for the National League for Democracy, Nyan Win, told VOA Burmese Service Friday that Aung San Suu Kyi is suffering from severe leg cramps, which keep her awake at night. Burma’s military government said last week that she receives good medical care in prison. Nyan Win also said the court has postponed final arguments in Aung San Suu Kyi’s trial from next Monday to next Friday. He said no reasons were given for the delay. Aung San Suu Kyi is on trial for allegedly violating the terms of her house arrest. The trial stems from a visit by an intruder who swam to her lakeside home in early May and stayed overnight. The American intruder, John Yettaw, is also on trial. He told the court he had dreamt that the 63-year-old Nobel Prize laureate would be assassinated and that he came to warn her. If convicted, Aung San Suu Kyi could be sentenced to a prison term of up to five years. She has spent 13 of the past 19 years under house arrest. The sole defense witness allowed to testify argued in court Thursday that it was the job of government guards outside Aung San Suu Kyi’s home to keep intruders out. Burma’s military government lashed out Thursday at foreign critics of the trial. Deputy Foreign Minister Maung Myint said during a Europe-Asia summit in Cambodia that the trial is an internal legal issue, not linked to politics or human rights. The international community has condemned the trial as a pretext to extend the opposition leader’s house arrest and bar her from elections next year. The British ambassador in Burma, Mark Canning, is one of the few outsiders to have been allowed into the courtroom to witness parts of the trial of Aung San Suu Kyi. In the second part of a series on her trial, he recounts his experiences. Burma‘s leaders have been pursuing their road map towards a “disciplined democracy” for so long that few people could tell you what stage they’ve reached. But the pace is picking up: an election is to be held next year, although in what form nobody yet knows. That is why the events in the courtroom at Insein are unfolding. So why is Aung San Suu Kyi important to the future of Burma? Nobody – and certainly not the lady herself – pretends she is the answer to all of its myriad problems. But she’s perhaps the only person capable of bridging the yawning political divides between opposition, ethnic nationalities and government. Unless she is allowed to play that sort of role, the task will become immeasurably more difficult. Suu Kyi has repeatedly made clear her willingness to work with the military government in a process of political reconciliation. She is viewed by them as a threat. But she’s actually an opportunity, to the extent that she’s declared herself willing to work with them towards the sort of future that the current direction of travel will never deliver. Sitting in the decrepit courtroom this week reminded me of how far this country is sliding: not a computer or modern aid in evidence, the torches confiscated from the American intruder looked as though they might have been left by alien intruders. It was a scene with which George Orwell, from his days here, would have been entirely familiar. In the midst of a region that has delivered unparalleled benefits to its population, it’s sad to see a country being taken in the opposite direction. A campaign has been launched at 64forsuu.org allowing visitors to leave a message of support for Suu Kyi in the run up to her 64th birthday on 19 June. We all hope it will draw the world’s attention to her plight and shame the generals into doing something about it. Perhaps only here in Burma could the bizarre events of the last few days have unfolded. Out of the blue, a show trial has been mounted by the country’s military rulers against Aung San Suu Kyi. Her offence? To allow an American intruder into her property, thereby breaching the terms of the detention to which she’s been subject since May 2003. This is surely the only place where the victim of the break-in ends up being charged. Lying behind this is the regime’s plan for stage-managed elections in 2010. Suu Kyi spoiled the party in 1990, and they are not about to allow it to happen again. So when the generals learned of the strange happenings in Rangoon, they must have seized on it with some joy: here was a way to negotiate the awkwardness of the expiry of her current term of house arrest and to set the custodial clock ticking afresh. Things haven’t gone quite to plan. The trial has whipped up a storm of criticism. Burma’s neighbours have been outspoken, making clear that the “honour and credibility” of the country is at stake. It’s brought Suu Kyi back to centre stage and reminded everyone what an important figure she is. It’s provided further evidence – if it was needed – of how the 2010 polls will be conducted. In the face of all this, the generals have tacked and conceded access to the courtroom for foreign diplomats. We’ve been allowed in twice, last week and this. The court is situated in the compound of the notorious Insein jail, a grim and forbidding place shaped like a cake tin, where many of Burma’s political prisoners are housed. It has the familiar trappings: two robed judges, defence, prosecution, motions, civility. An ancient typewriter clacks out the record. Carbon paper is stacked ready to go. Dogs bark. Ceiling fans whirr. Prison staff crane to catch a glimpse of the Lady. To one side is the paraphernalia confiscated from the intruder. No James Bond devices. No stealth submersibles. No CO2 rebreathers. Just a pair of home-made fins, a flotation device fashioned from water bottles, assorted bits and pieces and – most intriguingly – the robes and Jackie O sunglasses in which Suu Kyi was to be asked to make her escape from Rangoon. Two bemused police ladies were asked at one point to model these outfits, complete with glasses, for the benefit of the court. One of the curiosities of this affair is how, in the most tightly guarded corner of one of the most tightly controlled countries, a visitor from overseas was able, not once but twice, to bob across the fetid waters of Inya Lake to Suu Kyi’s home. The entry of Suu Kyi was a memorable moment. Aside from some TV pictures of her meeting visiting UN envoys, she hasn’t been seen since for six years. Despite almost two decades of extraordinary pressure – more than half of it in detention – and agonising personal sacrifices, she looked in remarkable shape. Calm, dignified, upright, exuding quiet authority but no hint of bitterness towards the prosecution side. She commanded her team and in many ways the room. There was a telling moment as she entered when the police guards rose to their feet before lowering themselves sheepishly down. She welcomed our presence. She hoped to meet us in better times and said how good it was to see people from the outside world. It was deeply impressive and one was left wondering how she managed to display no trace of indignation at this latest twist. It was good to get access, but I don’t imagine anyone will confuse two short trips to the courtroom with the fundamental issue: the illegality of her detention and that of the 2,000 other political prisoners held in Burma. We’re often told Suu Kyi is no longer relevant, but what went on in court told a very different story. She remains a towering and respected figure across the political spectrum and the Burmese people, despite living in one of the most disconnected and isolated countries in the world, are agog at what’s happening. The trial is a glaring injustice. But there’s an important wider picture that gets less attention: the 2,000 other political prisoners who languish in Burma’s jails and work camps, the repression heaped on many of Burma’s ethnic minority peoples and the persistent denial of almost all human rights. Suu Kyi is in many ways a symbol of a much broader misery and is one among many brave people who are struggling to achieve a better future for this country. So where’s the trial going? It’s difficult to see anything but a guilty verdict. Despite the familiar judicial trappings, these trials tend to be pre-scripted. All decisions of any significance in Burma are made by the ubiquitous “higher authority”. This will be no exception and the outcome will be determined many miles from the courtroom. The generals will want to make sure Suu Kyi is unable to play a role in the elections next year. So the betting is on a sentence that extends her house arrest well into 2010 or beyond, although there could be some unforeseen twists along the way. The prosecution yesterday rejected three of the four defence witnesses her team asked to bring forward. The government called 14. The trial wrapped up for the day a short while ago, and we’re told proceedings will reconvene on Monday for final statements. A verdict could follow the same day. Nobody expects it to be anything other than bad news. The heavy security presence on the streets suggests the same. The government newspaper trumpets that this will have no bearing on the election plans: “The government is determined to continue hand-in-hand with the people to implement the Seven-Step Road Map in accordance with their aspirations.” Other important news jockeys for position on the New Light’s front page: “PTT lubricants introduced”, “Thayet maintaining development momentum”, “Nation now on path to development”. The health of jailed Burmese opposition leader Aung San Suu Kyi is a cause for “grave concern”, her National League for Democracy (NLD) party has said. The NLD says Ms Suu Kyi, 63, has not been able to sleep at night because of continuing cramps in her legs and needs urgent medical attention. Ms Suu Kyi is on trial for allegedly violating the terms of her house arrest after a US man broke into her home. She denies the charges and faces five years in prison if found guilty. Ms Suu Kyi has suffered from ill-health in the past. Shortly before her arrest on 14 May she was treated for dehydration and low blood pressure. The NLD said she was “in desperate need of proper medical treatment”. “We are very much concerned about her health,” it said in a statement. Ms Suu Kyi has been under house arrest and banned from seeing all but a small group of people for 13 of the past 19 years. She was arrested on 14 May after an American man swam across the lake to reach her compound, spending two nights there. Critics of the trial say it is being used as an excuse to keep Ms Suu Kyi in detention until after elections scheduled for next year. But Burma’s ruling junta has rejected the international condemnation, saying the trial is “an internal legal issue”. YANGON, May 29 (Reuters) – The party of Myanmar opposition leader Aung San Suu Kyi expressed “grave concern” on Friday for her health while she is in prison facing charges that could jail the Nobel laureate for up to five years.